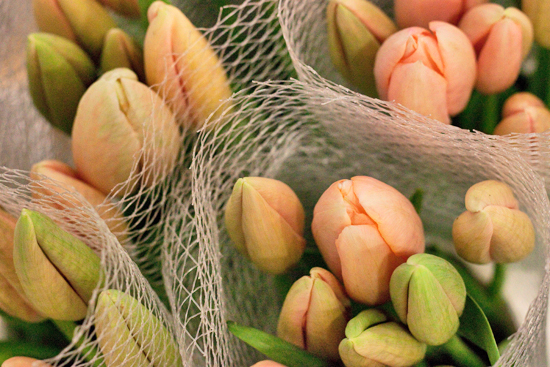 In this month's Product Profile, we're going to take a look at an iconic spring flower, which is in abundance at New Covent Garden Flower Market at the moment…the tulip. 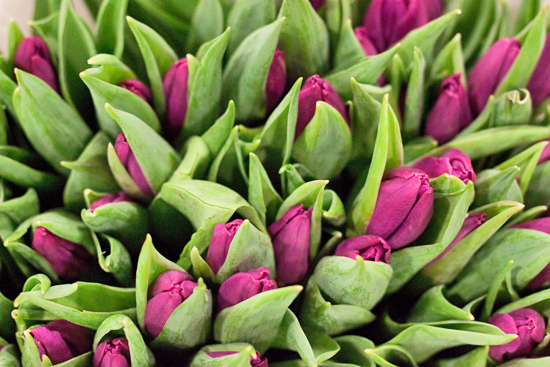 Part of the Liliaceae family, the name tulip comes from the Turkish word for turban, 'tulbend', as the shape of the flower resembles this traditional form of headwear. 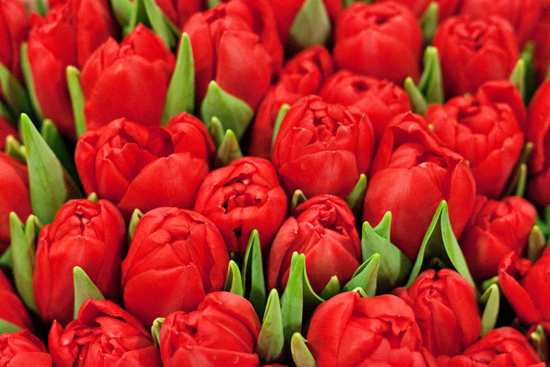 And its botanical name is Tulipa. They come in a kaleidoscope of colours including white, red, yellow, pink, purple, orange and green. Plus, there are also striped and bi-colour varieties. 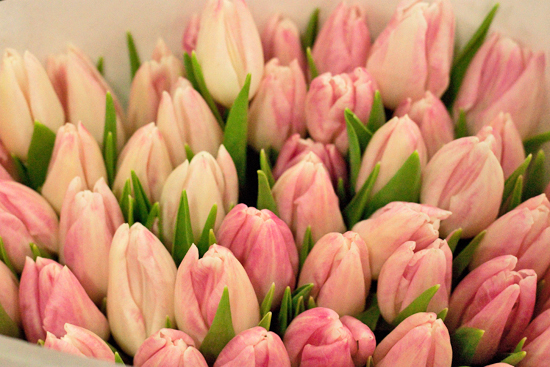 Tulips are generally on sale from October/November through to May/June. But now is their peak season. 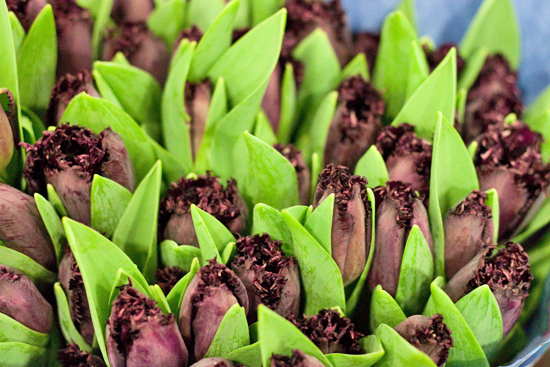 There's also a limited supply from July-September, as some growers freeze their bulbs to enable year-round availability. 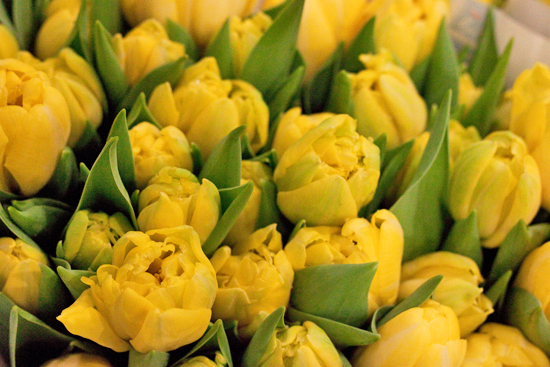 There are several different types of this wonderful bloom at the Market. 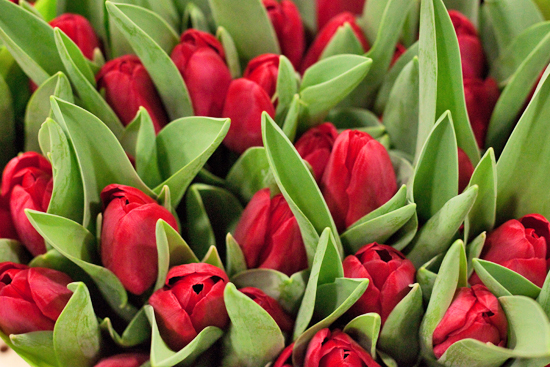 Single tulips are the most common variety, with their six smooth waxy petals. 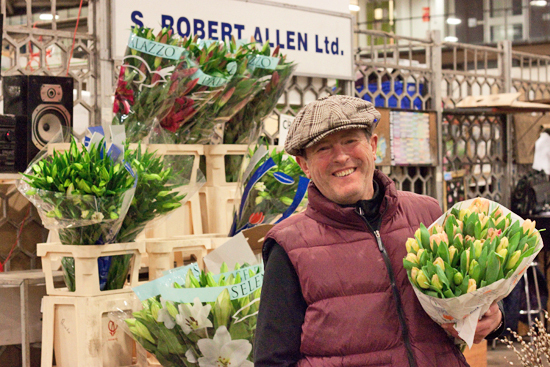 And at some of the traders, including S Robert Allen, Pratley and E Four, there are British tulips which have been grown in Spalding in Lincolnshire. You'll find them either available as a box of mixed colours or one single colour. 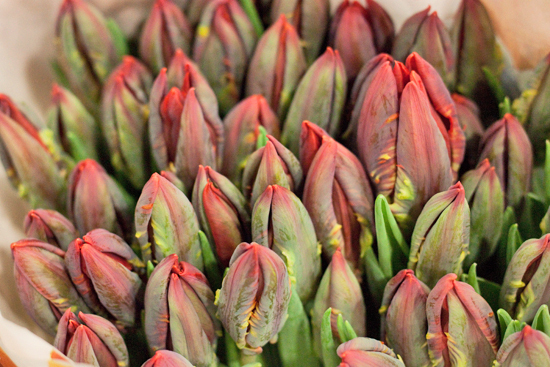 The traditional way for them to be sold is packed, lying down out of water, in boxes of 40 stems, made up of bunches of 5 stems. 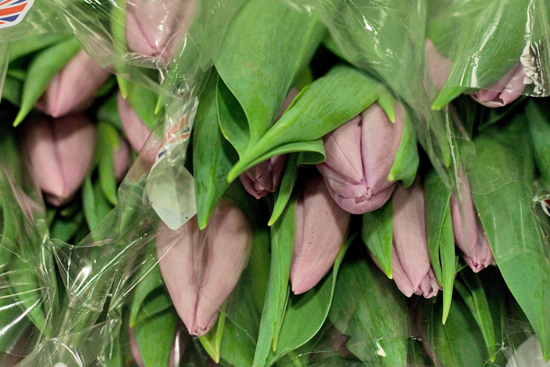 Some British growers have started sending tulips to the Market in wraps like the Dutch (which you can see below at Pratley). But they're still sold by the box. 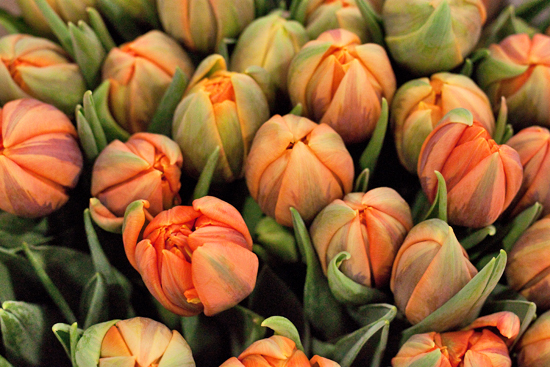 Here are some of the Dutch single tulip varieties currently available. 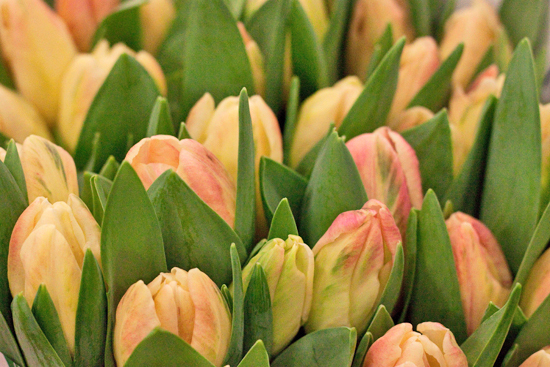 Zest Flowers have a great selection of tulips. Here's Tony, together with Strong Gold (yellow) and Antarctica (white) varieties. 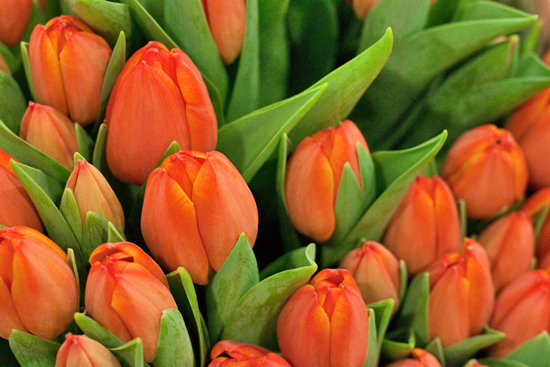 Double flowering varieties are defined as tulips that have more than six petals. And here are some examples. 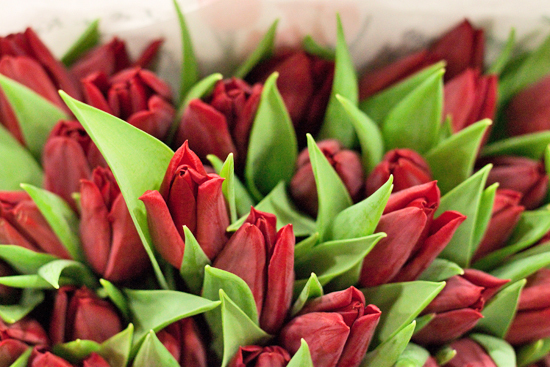 Parrot tulips have ruffled curved petals, which are said to resemble the bird's feathers, hence the name. 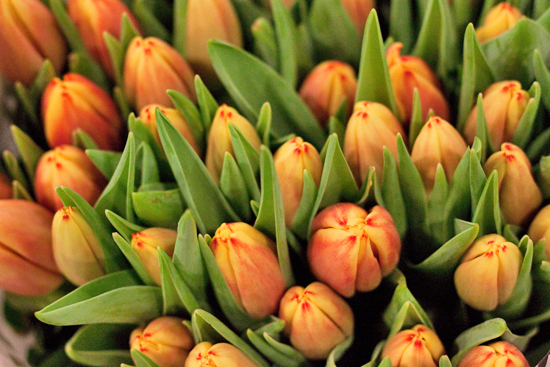 Fringed tulips have petals with serrated edges. 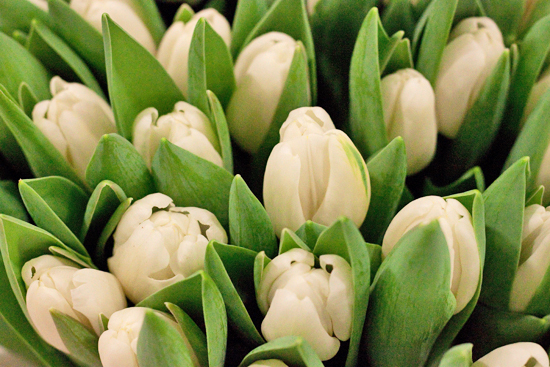 And Honeymoon, a white tulip, is very popular for weddings. 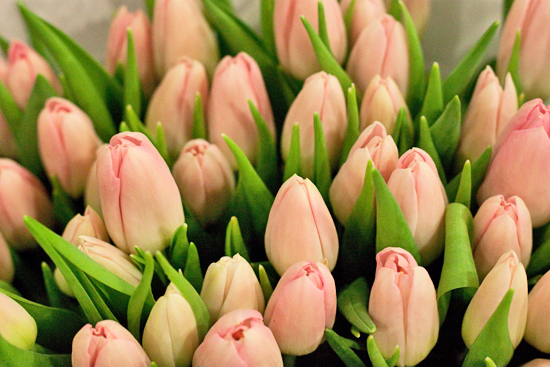 French tulips have longer stems and larger flower heads than standard tulips. So they're perfect for bigger floral designs. 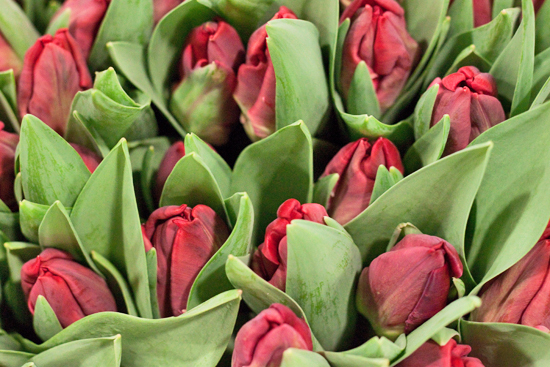 The price of tulips at the Market is very much dependent on whether they're British or Dutch, the type, availability and time of year. 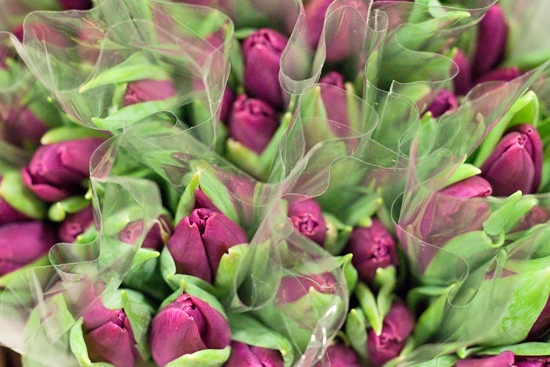 Several of the traders commented that in the run up to Christmas, tulips have been a little dear due to a general lack of supply. But now they're starting to come down in price. 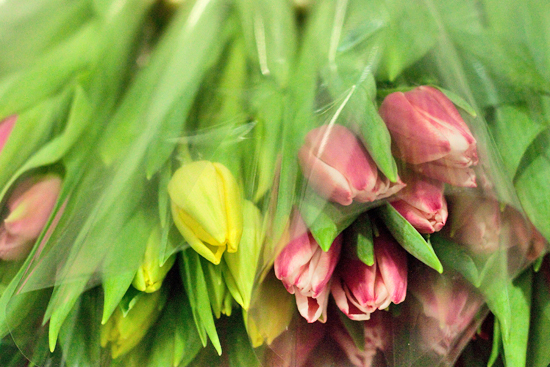 And as Dennis says, "When flowers are at their best, they're at their cheapest". 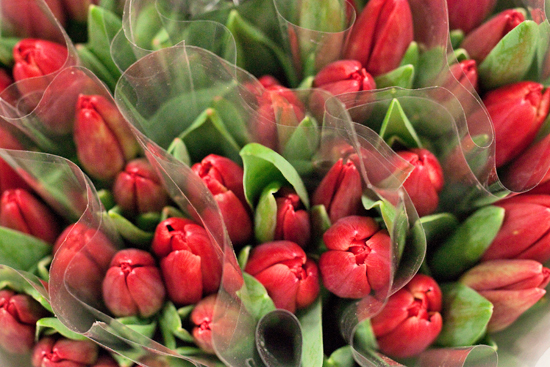 Dutch tulips come in wraps of 50 stems, made up of 5 bunches of 10 stems. 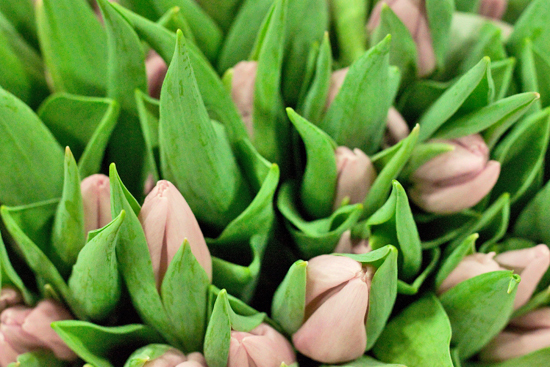 As mentioned earlier, British tulips are usually sold in boxes of 40 stems, made up of bunches of 5 stems. 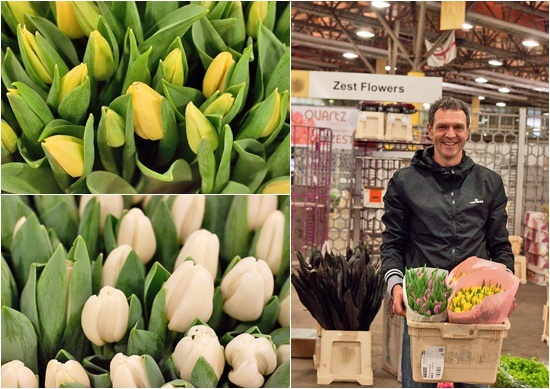 Trevor at S Robert Allen said that the mixed boxes of British tulips tend to be more popular than boxes of a single tone, because of the variety of different colours. 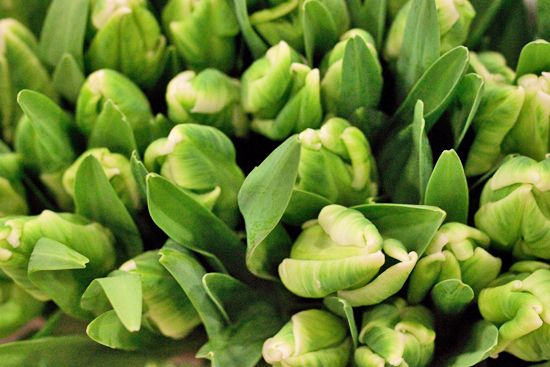 When choosing tulips, look for strong green, healthy leaves. To condition them, firstly remove any excess foliage. Then cut the stems on a slant and place them in a clean vase with fresh water. Keep them in a cool place, away from direct sunlight and sources of heat. Tulips continue to grow in water. So, if you decide to arrange them with other flowers, recess the tulips slightly in the design to account for them continuing to grow. 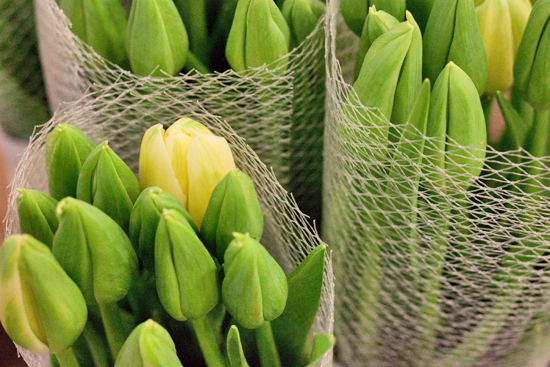 You may also have to trim the stems daily to maintain the arrangement. They're thirsty flowers. So you'll need to keep the container topped up with water. Also, be aware that their flower heads tend to lean towards the light. 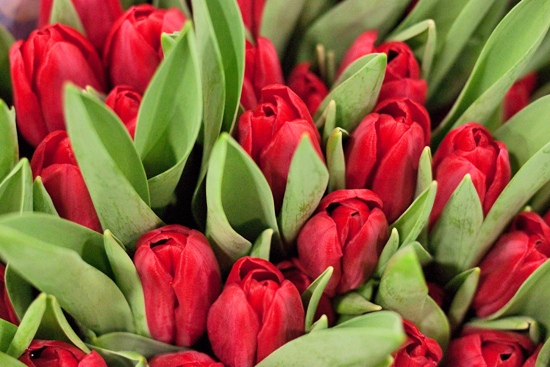 Did you know that different coloured tulips have different meanings? 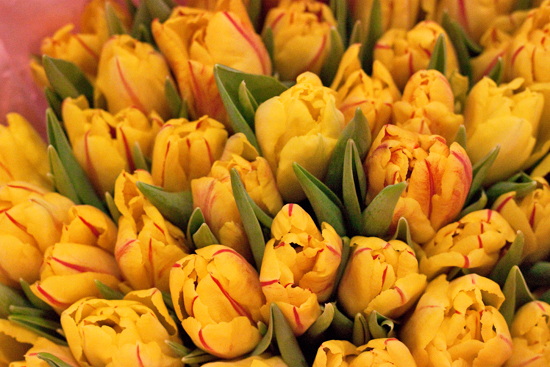 According to Shane Connolly's book, The Language of Flowers… red tulips mean 'Declaration of love', yellow mean 'Hopeless love' and striped tulips mean 'You have beautiful eyes'! 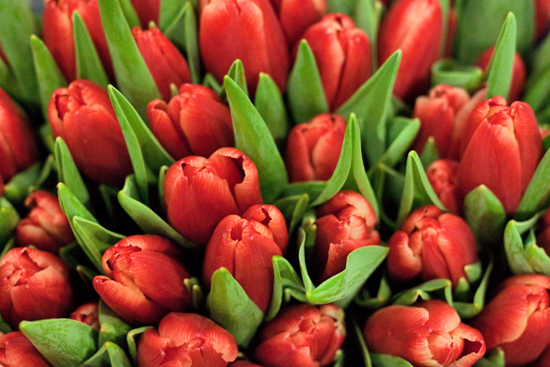 Perhaps the language of flowers is something to tell your customers about in the weeks leading up to Valentine's Day?